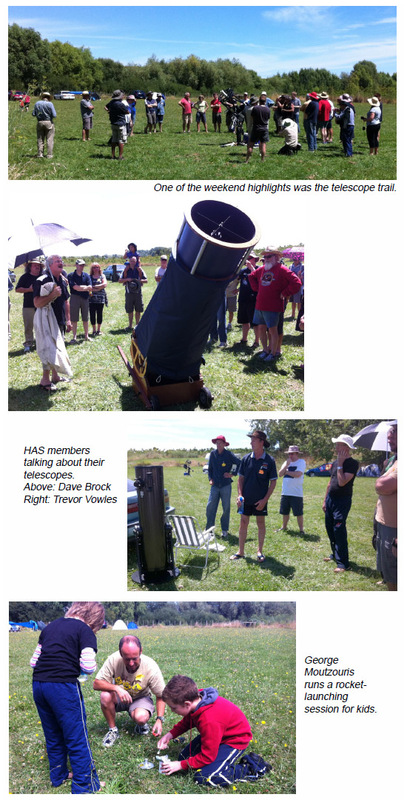 This article was originally written for the Hamilton Astronomical Society monthly bulletin, February 2012. This year I finally attended my first star party and, to my surprise, managed to convince my family to join me. The event was Stardate 2012, a weekend gathering of astronomers organized by the Phoenix Astronomical Society. It was held at a fully reserved camping ground near Hastings, on the 20th to 22nd January. There were two accommodation options: Shared bunk rooms or tent spots. When booking, we only had a brief description and no photos so it was hard to imagine what the bunk rooms were like. We opted for a tent spot which was the right decision - the bunk rooms turned out to be unsuitable for families. We arrived mid-afternoon on Friday and pitched our tent in a nice spot. Quickly meeting some of our neighbours was a good move, as they were veteran star partiers who helped us find our way around. The opening ceremony was surprisingly short and left me with the vague feeling that I didn’t really have enough information. Oh well, people seemed very friendly and I was sure we’d be able to ask for help as needed. The first presentation was an impressive showcase of images from the 2011 RASNZ astrophotography competition, hosted by well-known Gisborne astronomer John Drummond. This was also the session in which I learned just how uncomfortable a seat can be. As soon as the first talk was over I went back to the tent and grabbed a pillow to sit on. I never went to another talk without it. After a tenuously relevant lecture about skin cancer, John Drummond was back with an interesting talk on elliptical and spiral galaxies. Then came the reason we were all there - telescope viewing. This was held in the lower paddock, where everyone with a telescope sets up and invites everyone else to have a look. 4YO Floyd was asleep by this time, but 6YO Jessica was keen to go observing. Unfortunately the first six telescopes we visited were all pointed at M42! I guess that’s sort of understandable as people were getting themselves established, but perhaps a little coordination might have been a good idea. Although it was fun chatting to people along the way, after the sixth telescope Jessica was tired, a little disappointed (M42 is nothing new to her) and ready for bed. Half an hour later I was back by myself and hoping for something more interesting. Sadly, this is where I got my biggest disappointment and made my biggest mistake. The vibe had changed. Most of the “good” telescopes were surrounded by small groups of people huddled together and speaking in low voices. Feeling like a complete loner, I tried my best to insert myself into a couple of groups or even get a closer look to see what was going on. In the dark this wasn’t easy. I have no doubt that these were friendly people but they didn’t seem to be very mindful of newbies and I just couldn’t seem to get a look-in anywhere. Sure, I could have been more forceful and I would have been welcomed. But I was still finding my way and I didn’t feel comfortable with the situation. So, less than two hours after lecturing my family about how important it is to seize every observing opportunity, I gave up and went to bed with the plan of finding a “buddy” to help me the next night. What was I thinking? The next two nights were clouded out and there were no more observing sessions. Curse my idiocy. Saturday morning featured the first of two sessions for children: "Constellations and Asterisms". Remarkably, this managed to hold my kids’ attention for almost ninety minutes. They’ve still got the handouts and pictures of asterisms they designed themselves. At 12 noon we set off on the telescope trail, in which the owners of each telescope talked a bit about their gear. This was the highlight of the entire weekend for me, despite being way too hot in the midday Sun. It occurred to me that a similar sort of trail would have been very useful the previous night. Instead of letting people try to find their own way around the viewing scopes, it would have been nice to have had a guide to help with introductions. I attended about half the remaining Saturday presentations and was fairly satisfied with all of them. The best was the evening talk given by Ian Cooper and Stephen Chadwick who have co-written a book called “Imaging the Southern Skies”. The book is due out later this year and I’ll be buying a copy. I was stunned at the quality of Stephen’s photographs, and equally impressed by Ian’s knowledge. The only downside is that I’m pretty sure the talk included every single photo from the book (it was a long talk). With no observing possible there was a movie on offer, but the thought of sitting on those bench seats a minute longer was too much. I went to bed. Sunday morning included a rocket-launching session for all ages. It was gold, and I can’t thank George Moutzouris enough for providing the weekend highlights for my kids. A buy-and-sell session over lunch was enjoyable and informative, although there wasn’t a huge amount of stuff for sale. The remaining presentations were all reasonably rewarding but finished on an embarrassing note for us. Our kids really wanted to see the Mars presentation, and since they’re well-hardened to watching grown-up space talks I thought it would be okay. As it turned out, the talk was more advanced than we’d expected and involved a lot of technical text being read from the screen. Our kids became too fidgety and we had to walk out, at which time we discovered the world’s noisiest door. I assume the entire hall was glaring at us but we didn’t look back as we slunk away. On a more positive note, I went for a walk at 2 a.m. and was surprised to find a clear sky. Three other people were about, so one of them brought out his 8" dob and we did a bit of observing. All in all, despite a few missteps I count our first Stardate as a success. The biggest surprise was my family’s response—I had been nervous about how bored they would get but I needn’t have worried. They’ve suggested that we all go back next year, and we probably will. Arrive by lunch time on Friday if you want a good tent spot. Ask for help and guidance. You don’t get a lot from the organizers but that’s okay once you realize it’s more a case of everyone helping everyone else. Don’t make my mistake and be too shy. Take a cushion for the talks. Before attending a talk, try to ascertain the technical level (they vary greatly). The kitchen closes without warning on Monday morning. Retrieve all your food and other belongings before then. Treat your first star party as a learning experience. If you’re interested in going to next year’s Stardate, feel free to contact me and I’ll be your "buddy".